Friday morning, Garance Burke at the Associated Press's "Investigative" unit broke what the wire service must have believed was an earth-shaking story that "The Trump administration is considering a proposal to mobilize as many as 100,000 National Guard troops to round up unauthorized immigrants." 30 hours later, you couldn't find that story, or its "Trump administration denies" follow-up, at any of its "Big Story" site's key pages. At that point, there were (and there still are) no related stories present at the AP's "Big Story" home page, or at its more detailed "Latest News" page, or at its needs-to-be-renamed "2016 Presidential Campaign" page (which is carrying many current stories on Trump administration-related and general political developments). The latter two pages present their stories from the most to least recent, and have items listed as far back as December. This invisibility tacitly but effectively acknowledges that the AP's supposed Friday blockbuster is not the "Big Story" it wanted everyone to think it was. The fact is, it never was a "Big Story." Instead, it was and remains an irresponsibly released, agenda-driven story riddled with fake information. The Associated Press dropped the ball Friday with a supposed scoop alleging President Trump is considering deploying approximately 100,000 National Guard units to round up illegal immigrants. The Department of Homeland Security is considering no such thing, an agency spokeswoman said following the report's publication. Further, they said, the DHS memo on which the entire story hinges was only an early, pre-decision draft, and it wasn't written by the agency's secretary, John F. Kelly. This is the exact opposite of what the AP reported. The draft memo obtained by the news agency didn't specifically suggest nationalizing the National Guard. To be clear, the memo stated the obvious, namely that "State National Guard components are employees of their respective states and are under command of their governors." The AP used this as reason to claim that "The troops would not be nationalized," which is as newsworthy as saying that "the sun will rise in the east and set in the west tomorrow." The draft memo also never used the 100,000 figure cited by the AP, though it's possible the news group came to that number by tallying the National Guard units currently stationed in the 11 states where they would supposedly be used to crack down on illegal immigration. The report doesn't explain this. Thus, the AP appears to have assumed on its own that every single available National Guard member in the states involved could be pressed into this service. There's only one problem: The memo specifically refers to "qualified members of the State National Guard." Obviously, there's a difference, likely quite significant, between "all" Guard members and ones who are "qualified" to carry out the anticipated duties. ... The AP original report on the matter did not include a copy of the draft memo. It was on journalists at competing newsrooms to get ahold of the document to see for themselves what was supposedly floated by government officials. Unfortunately for the AP, what reporters found didn't quite match up with what was reported. The news group responded to criticism of its reporting Friday by stressing it contacted the White House prior to publishing the story. The AP said its requests for clarity went unanswered. ... Though the news group reportedly gave the White House 24 hours to respond, it didn't extend the same courtesy to DHS. The federal agency wasn't contacted for comment until the morning of the story's publication, according to one DHS official and the AP's own reporting. ... 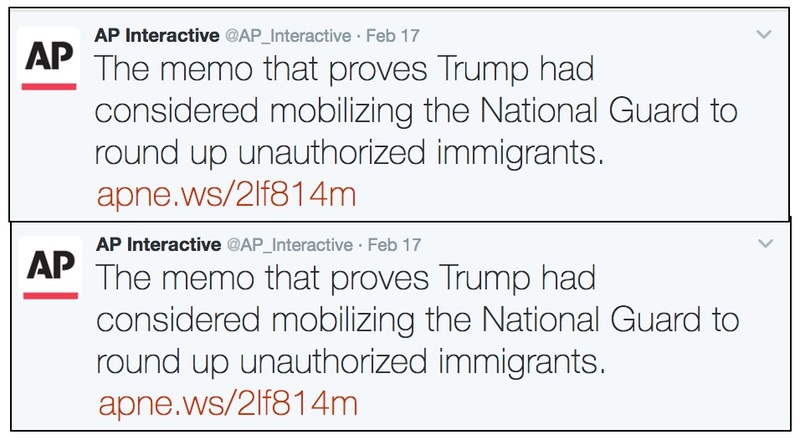 The (AP's) social media account doubled-down later Friday afternoon, and claimed the draft memo, "proves Trump had considered mobilizing the National Guard to round up unauthorized immigrants." So the AP's Investigative unit had their supposed breathtaking scoop, and made a conscious choice not to present their related evidence, forcing others to find and vet it themselves. That failure, combined with the AP's conscious choice not to contact DHS until Friday morning — upon learning the previous day that the White House wasn't even aware of the memo's existence — gave a false and misleading story several hours of oxygen before anyone else could call BS on their nonsense. I don't want to hear that the AP had only 140 characters available. The tweets above are 112 and 132 characters, respectively. Adding the word "admin," or, even better, describing who was involved as "Trump's DHS," would have kept each tweet shorter than its limit. Thus, from all appearances, the decision to tweet statements that Trump himself "considered" using the Guard was deliberate. It conveniently follows the 13th and final of Saul Alinsky's "rules for radicals": “Pick the target, freeze it, personalize it, and polarize it." The fact is that the draft memo "proves" nothing about Trump's involvement, and the claim that it does is utterly fake. The AP's failure to include the memo in its original reporting, its false identification of Trump as personally involved and the release of its original report late Friday morning all served a larger purpose, which the Examiner's Adams identified: "Reporters and pundits reacted with the usual mixture of shock, horror, dismay and lots of allusions to the Nazis." Though its stories are now relatively tough to find, the AP packaged what Adams correctly described as "the exact opposite" of the truth in a 30-second video found at CNBC, one of a very few websites still carrying its original story (virtually all other subscribing sites have replaced it with a "Trump administration denies" follow-up piece). Note that this video was produced after the Trump administration's denials, but that the text boxes presented in the video still present the denied statements as if they are true. This episode should convince those who still wish to place presumptive trust in the nation's de facto gatekeeping news service to stop doing so. No item the AP publishes is deserving of any more presumptive trust than stories originating from the Washington Post, which has made itself a virtual national joke during the past several months; the New York Times, whose journalists openly declared that it was their duty to abandon objectivity in covering Trump; or the nation's Big Three and liberal cable networks. We must remember that the AP was as involved as any of these other news organizations — arguably moreso, because of its breaking-news role — in the planning and hoped-for successful execution of Hillary Clinton's presidential campaign. While that didn't work, the effort to prevent Donald Trump and his agenda from succeeding by any means necessary, no matter how journalistically dishonest, clearly continues.